40% of Americans flush with their feet rather than touch a toilet. 20% of Americans use paper towels to shield their hands in public restrooms. 4 out of 5 Americans are concerned about germs in public restrooms. 200 million bacteria can populate a single hand after being in a public restroom. Auto Flush Valves for Urinals and Commodes: E-Z Flush converts manual flush valves into automatic, hands-free, urinals or commodes. Guaranteed flushing eliminates odors and un-flushed fixtures while also improving your overall building presentation. This sensor technology transforms your facility into a modern touch-free restroom. Available in: chrome. Auto Flush for Tank Toilets: This easy to install system allows you to convert your tank-style toilet into a touch free fixture in minutes. The integrated handle makes it vandal resistant. The easy to operate manual flush option allows for added flushes if necessary. Available in: chrome. Auto Faucet: The sophisticated sensor technology and elegant design make the germ free auto faucet the standard in the industry. It conserves water while preventing cross contamination. 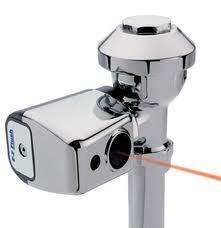 A highly advanced sensor is not affected by reflection or abnormal lighting.